So I discovered this weekly blog meme, a Snap, a Set & a Song, a little while ago and haven't had the chance to participate until now. This week's theme is 'Mask' and if you'd like more info on how to participate then head over here. I'm also linking this up to Flog Yo Blog Friday, another link-up I haven't had a chance to participate in for a few weeks. My inspiration for 'Mask' has to go back to my favourite musical The Phantom of the Opera. I LOVE it! I first saw it in 1994 when I was 12 years old and fell in love with the music and the story. In June 2010 I was lucky enough to see it again, this time in New York, on Broadway! A dream come true! 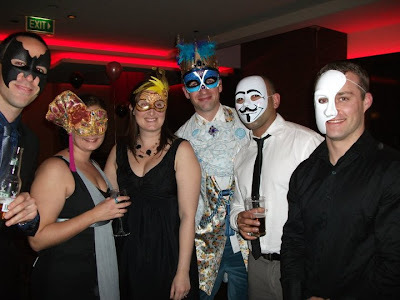 This photo was taken in 2010 at a friend's 30th birthday Masquerade party. It was a fantastic night and I will admit to drinking waaaay too much red wine (stupid open bar made me do it!) I'm 2nd from the left and Dave is 1st on the right in the Phantom mask. While not my favourite song from the show it is up there. Enjoy! Do you like musicals? Have a favourite? I saw Phantom of the Opera in Sydney years ago! Loved it! I also remember seeing Cats. Truly magical. Most recent one I've seen is Jersey Boys. Just love musicals!